In a medium saucepan, combine corn syrup, sugar and salt and bring mixture just to a boil over medium heat, whisking constantly (to dissolve sugar). Once mixture reaches a boil, reduce heat slightly and allow to gently boil for 1 minute. Remove from heat, add in peanut butter, chocolate chips and vanilla, stir mixture until chocolate chips have completely melted. Pour in Rice Krispies Cereal and toss mixture to evenly coat. Pour mixture into a buttered 8×8 (or 9×9) baking dish and gently spread and press into an even layer. 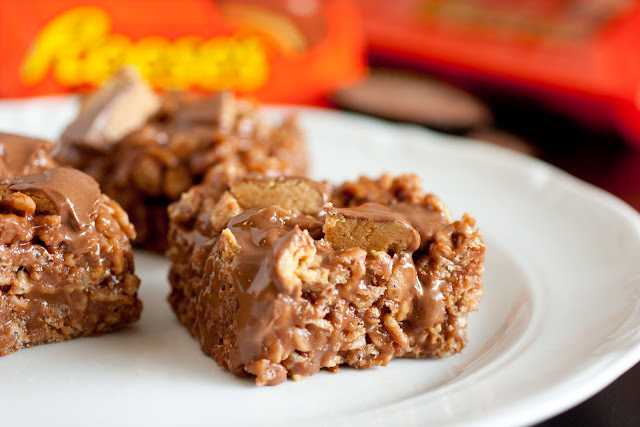 Allow to cool until just warm to the touch then evenly distribute diced Reese’s Peanut Butter Cups over top and lightly press them onto the coated cereal. Enjoy warm, with ooey gooey melted chocolate topping (my favorite, I love melted candy bars though =) or cover and refrigerate until chocolate has set, then remove from refrigerator and rest about 10 minutes at room temperature and cut into squares. Store in an airtight container.